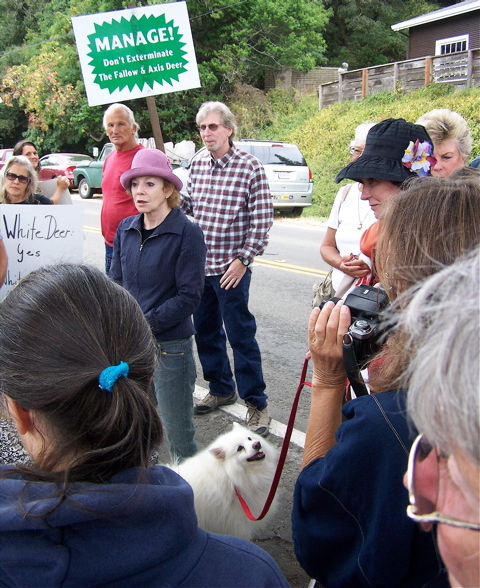 State Senator Carol Midgen (center) on Sunday afternoon lent her support to a crowd of more than 50 people, who were protesting the Point Reyes National Seashore’s beginning to kill off its fallow and axis deer herds. The park began shooting deer last month, along with giving contraceptive injections to some does. The shooting has temporarily stopped but is scheduled to resume in the spring. Midgen told the group that shooting deer to eliminate the herds is unacceptable to members of the public in this region. She offered to cut red tape with State Fish and Game to facilitate the additional use of contraception to control herd sizes. Demonstrators of all ages and lifestyles took part in Sunday’s protest against the deer killing. 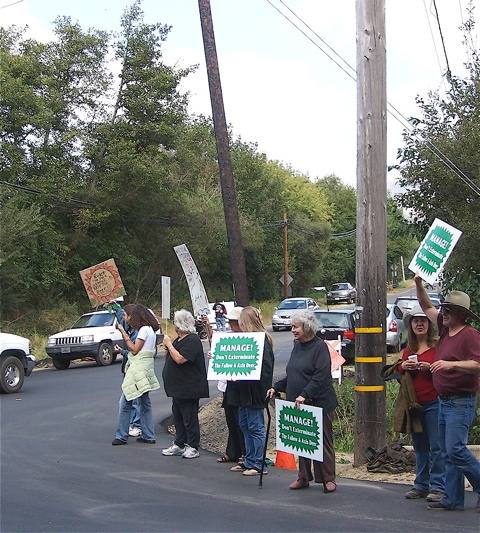 This group picketed at Bear Valley Road and Sir Francis Drake Boulevard (the levee road). Organizer Trinka Marris of Point Reyes Station afterward said she was pleased at how many members of the public honked and waved in support. Although the public generally loves watching the deer, the present park administration is trying to eliminate them as “exotic.” They are definitely that; the all-white fallow bucks are among the most majestic creatures in the Point Reyes National Seashore. Long ago, California zoos imported fallow deer from the Near East and axis deer from India and Sri Lanka. 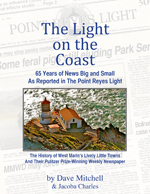 Sixty years ago, some descendants of those deer were brought to Point Reyes for hunting. When the park opened in 1965, hunting was banned, and in 1994, the present park administration stopped culling the herds. The park now complains that, along with being exotic, the herds are getting too big. 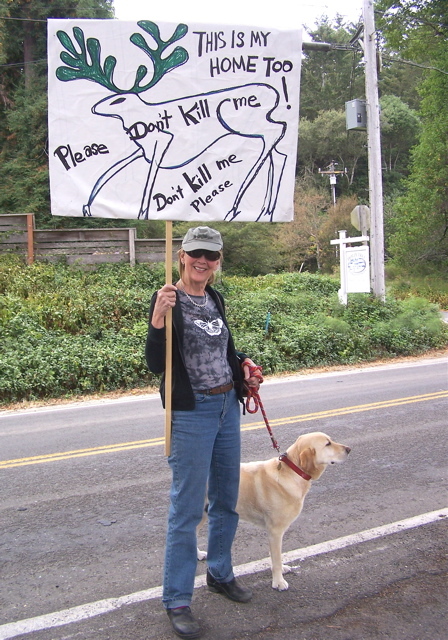 Bolinas resident Mardi Wood and her yellow Labrador Buddy were among the crowd of hopeful demonstrators. After Sunday afternoon’s demonstration in Inverness Park, I visited Drakes Beach where the tide was low, allowing long walks for the handful of people on the strand. 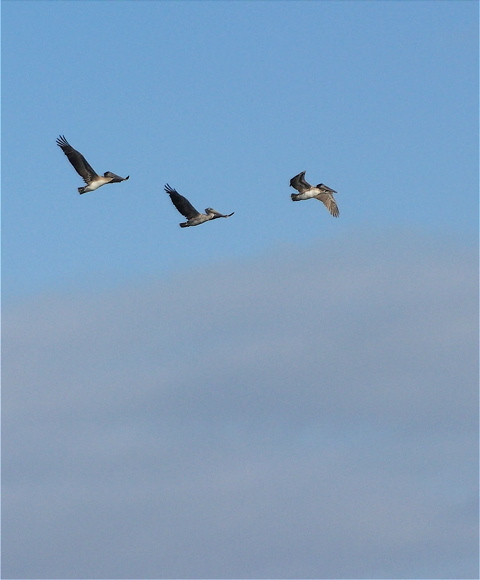 Brown pelicans hunt along the shore break for schools of fish. 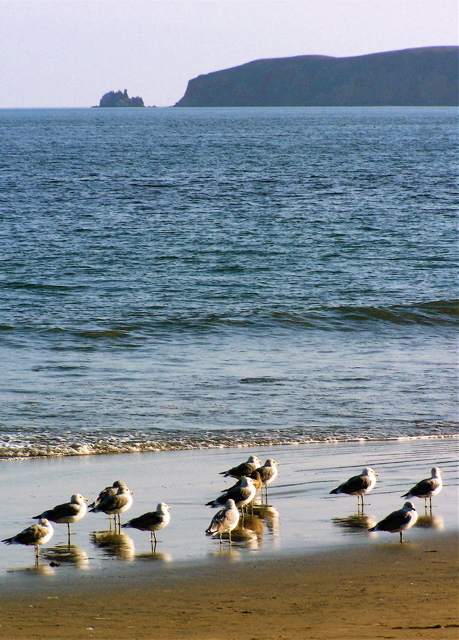 Chimney Rock as seen from Drakes Beach. 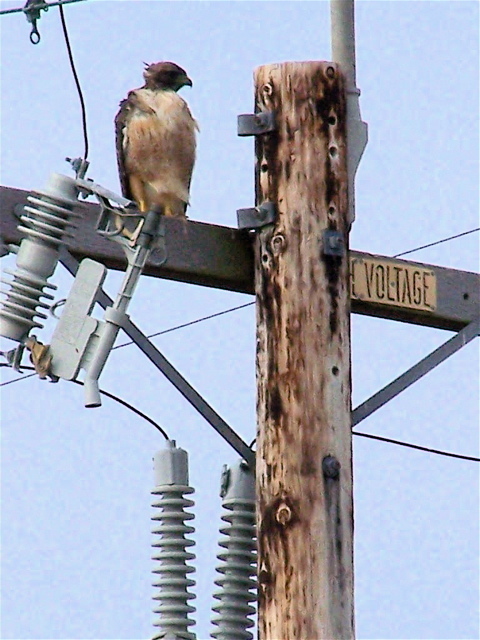 A windblown red-tailed hawk perches on a utility pole while hunting along the road down to Drakes Beach. Red-tailed hawks can weigh as much as 4.4 pounds and measure 26 inches long. Females are 25 percent larger than the males. The red-tailed hawk is protected by the Migratory Bird Act of 1918. 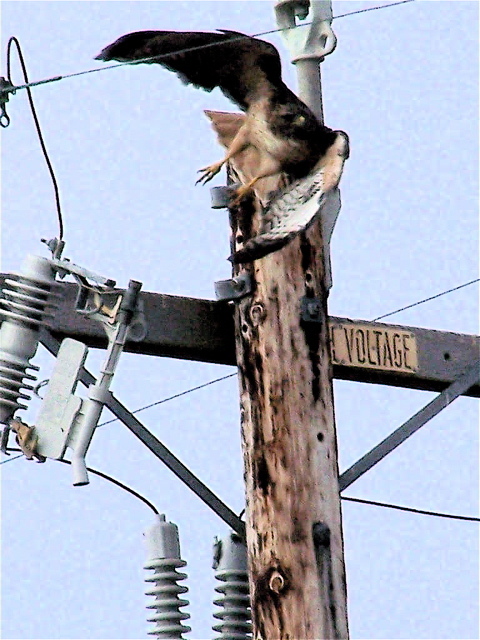 Red-tailed hawks eat primarily small rodents but also birds and reptiles. 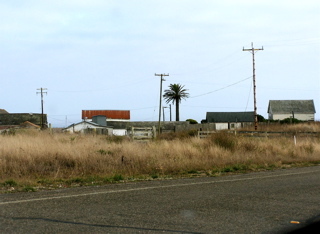 The Horick Ranch overlooking Drakes Beach has not been in operation since 1999. Vivian Horick, the last member of the family to live on the ranch in recent years, died in 1998. The ranch, also known as D Ranch, is the last tenant ranch in the park. 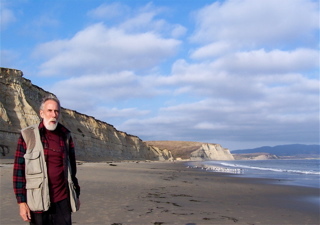 James Shafter, owner of most of Point Reyes, in the late 1800s divided it into ranches with alphabetical names. Although the ranch bears witness to how dairy ranchers lived on Point Reyes for more than a century, the buildings are getting minimal protection from the elements. Are there are any hard and fast data on how big the deer herd can get before it starts running into Malthusian law? In the upper Midwest, in years that the whitetail hunting season has gone poorly (for the hunters, that is), the State DNR has documented the eventual effects of that (massive deer die-offs from starvation and disease). Nature is not a gentle Disney character, and her remedies can be drastic. Anecdotally, I was struck by the comment from my sister, who worked in forest conservation and research for UW-Madison: “the woods just stink” from all the rotting deer carcasses. Sparsely Sage and Timely is powered by	WordPress 4.9.10 and delivered to you in 0.384 seconds using 64 queries.